This week in our Mini Monday Series features our Hootsville Row quilt pattern. This isn’t an actual mini quilt pattern, but we have a little trick up our sleeve. 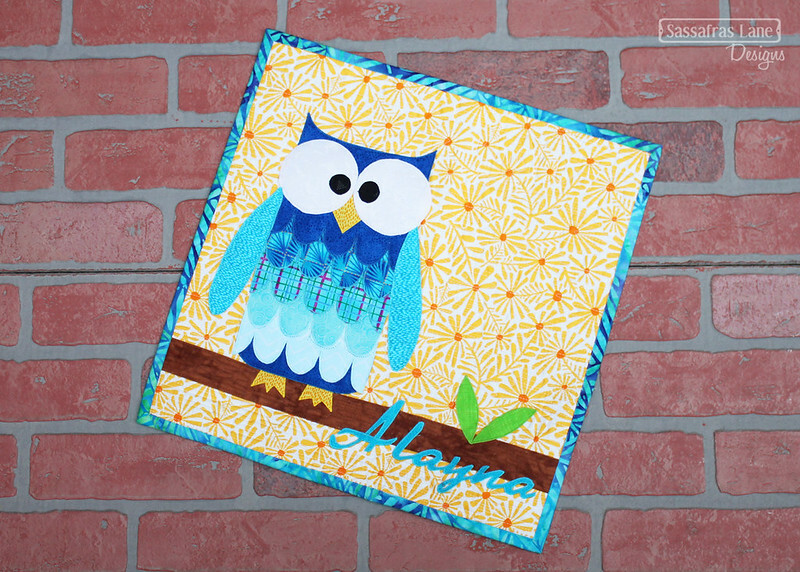 Instead of miniaturizing all 9 owls from the original Hootsville Row pattern, Kristy created a few mini quilts with just one owl sitting on the branch. 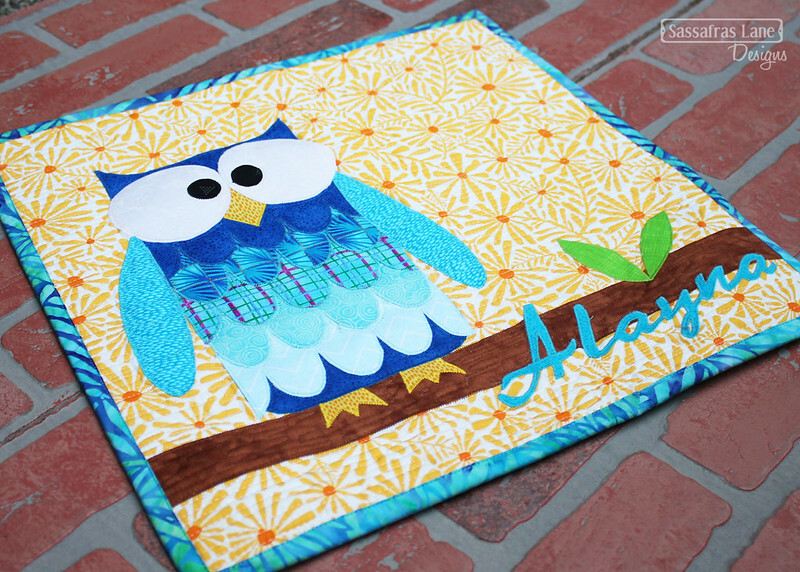 It is a lot less appliqué and a hoot to make! =] Puns are fun! The Hootsville Row pattern will be 20% off today and tomorrow (2/19/18 - 2/20/18 PST). Now let's chat about these “Mini” Hootsville Row! Kristy made both of these Hootsville Row minis for Alayna and me as gifts. She wanted there to be enough room to appliqué our names under the branch and still mix into our mini walls, so these minis finish at a 15” square. The owl can really be made up in whatever your heart desires. We made ours with one color and gradated the colors from light to dark down the owl layers. The background could be dark, could be light, could be rainbow - just make sure it has a little contrast from the owl! The eyes are the most fun to play with! Is your owl going to be a little cross-eyed, stargazing or checking out what’s going on below? This mini quilt is all appliqué. 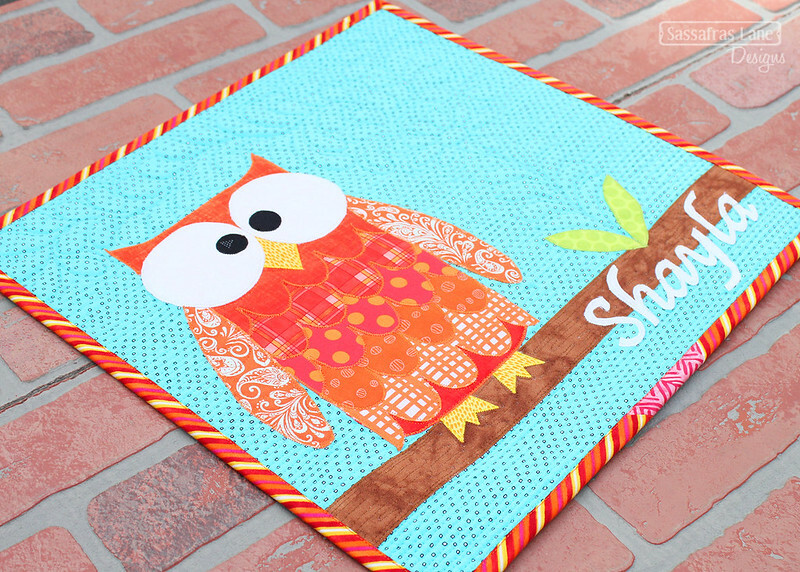 When you are only making one owl, the Hootsville Row pattern will fly together. I love to cut out appliqué pieces on the couch while watching a guilty pleasure! We do recommend using a pressing sheet, so you can layer all those owl pieces together first, before placing it on your background. We only have two sample of this, but something tells me we will have more over time. We aren’t dying to make another full Hootsville Row quilt right now, but these little individual guys are cute enough to become fun little minis, pillows and gifts! My favorite color is orange (surprise, surprise!) so, Kristy made me this adorable Hootie out of assorted orange scraps and placed him on an aqua background. He now hangs out with all my other minis in my sewing room! Alayna’s favorite colors are blue and yellow, so Kristy chose assorted blue scraps for the owl and placed him on a yellow floral print. This little mini matches all the others we have made her and looks great in her room! Share Your Mini Hootsville Row Projects! 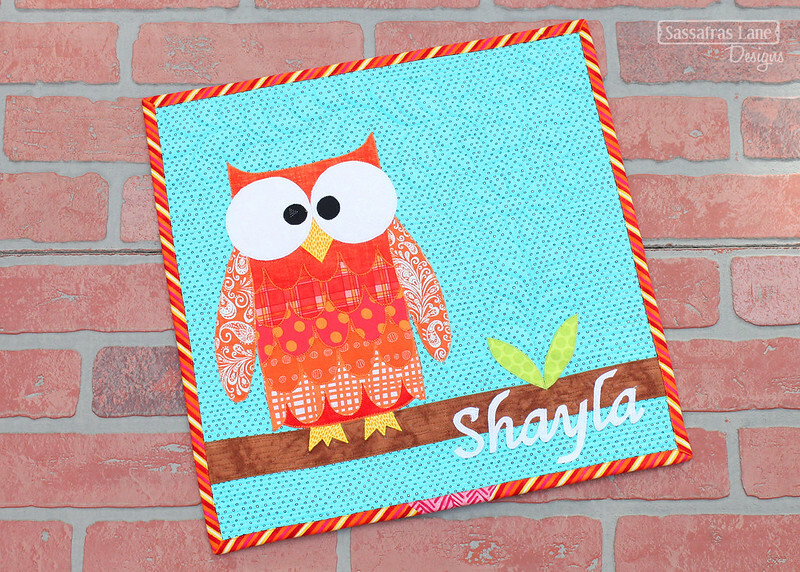 We hope this inspires you to dig into your scraps and make an individual Hootsville Row block as a mini quilt! If you do, be sure to share photos on social media so we can see it. Post them to our Facebook Group or use our #sassafraslane hashtag on Instagram! I am loving the font used for the name on the quilt. May I ask what the name of the font is or where I can find it? I am planning on making my first appliqué name on my son’s quilt who will be born in April. Thank you!